19:30 Das Edelweiss (Görlitzer Str. 1-3). 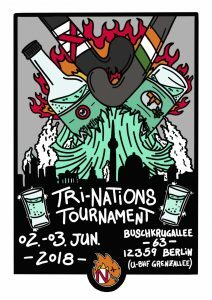 ab 22:00 Exklusive Tri-Nations Party im Privat Club (Skalitzer Straße 85-86). 16:30 Abschied und bis nächstes Mal in London oder Schottland, oder Irland oder in Berlin! and most importantly, start the dancing! 10:30 Shake off the cobwebs and make your way to the pitch for the cure. 16:30 Tearful Goodbyes and a high level commitment to meet at the next tour!